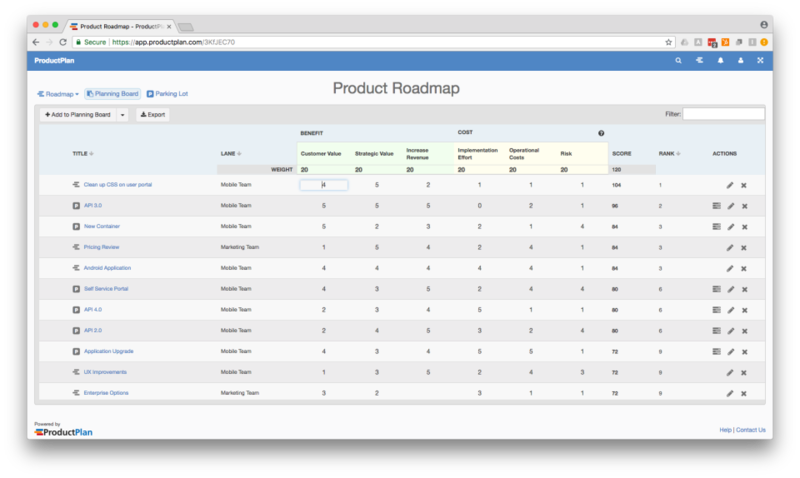 ProductPlan is easy-to-use roadmap software designed to help teams better plan and communicate their strategies. 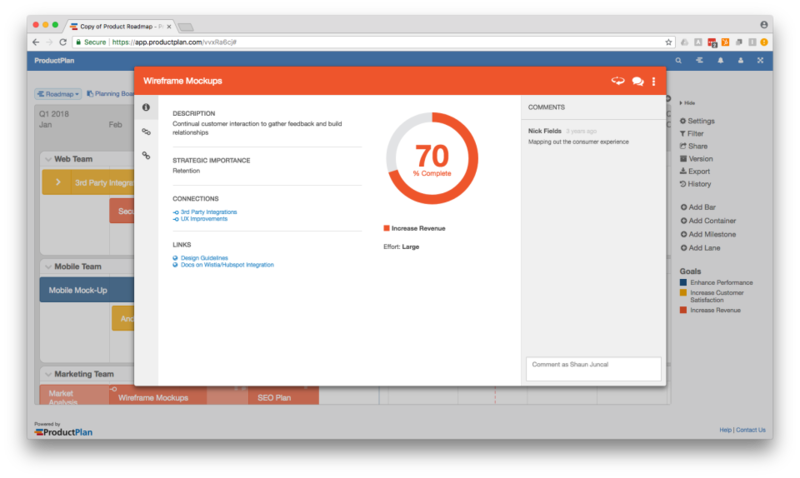 Our drag and drop features are intuitive and let product managers get started building beautiful roadmaps quickly. 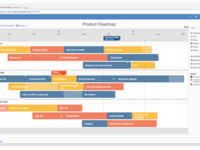 ProductPlan roadmaps are highly visual, communication-focused and built for team collaboration. Visit www.productplan.com to find out more. The tool of choice for any product development team! 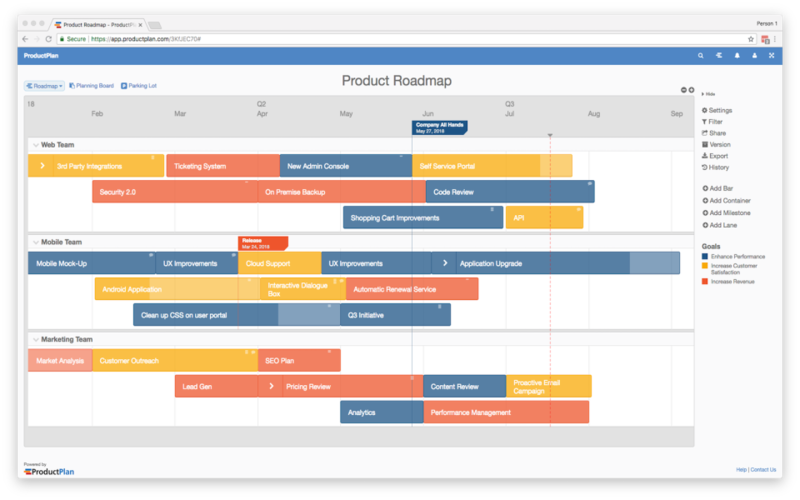 Pros: ProductPlans gives my team more visibility into our Roadmap - for current and upcoming initiatives. I can link each initiative to Jira which allows us to view the associated story and determine priority without having to search for the details. I can easily customize the view based on the audience as well as how much or how little they need to see. Giving my executives the high level overview of what our team is currently working on is imperative as they don't need to get in the weeds with details, whereas my development team does. Cons: One feature this software is lacking is the ability to move bars (story features) between lanes (projects) without having to drag and drop. I'd like to right click and get an option to select the lane and it auto move to the new lane positioning itself in the same time frame it currently sits. Overall: It's all about visibility into our development roadmap, knowing what is currently being worked as well as what is coming up in the pipeline. Cons: Scaling of gantt chart bar height (extremely minor issue) but that would help with showing the charts on monitor screens which don't allow for zoom-scaling. Overall: I use ProductPlan to communicate, coordinate, and visualize business goals for our business. This allows for Stakeholders to see the 50,000 ft. view while simultaneously keeping the Design, Development and Quality Assurance Teams focused and on-target. Our JIRA Epics and Stories integrate with ProductPlan via daily, or instantaneous, sync which count story points and/or number of stories per epic, allowing us to glance at a percentage of Epic completion at a glance. More than just a Gantt Chart, its a superb, integrated web application that helps keep our business focused. Customer services is awesome and they have worked with me a number of times to help solve and understand how to best use their product in tandem with JIRA. Recommendations to other buyers: Use the sync function and JIRA Epic tie-in. Make sure that the Stories are "Resolved" properly for the sync to work and calculate % Epic Finished correctly. 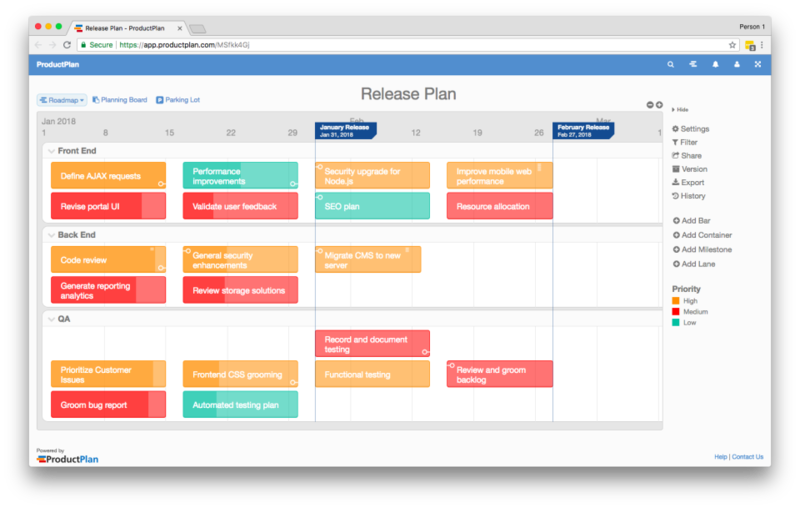 Once your workflows are dialed in, ProductPlan does the rest. Pros: The best benefit, for me, is how simple to use but effective it is. I've used MS Project and other tools that can be overwhelming when you open them up and not very intuitive. It didn't take me hours of watching videos to create my first roadmap. Another perk is customer service is quick to respond and always helpful. There are bugs in every application, so I've found a few but their customer service team has sometimes resolved things on their in within a matter of hours from me providing feedback about the bug. They also follow up via e-mail if I have something pending that gets resolved. Cons: Some aspects of it are almost too simple. More freedom with font size and placement of text would help the output look cleaner, especially when printing. However, I fully believe it's only a matter of time before this is implemented. 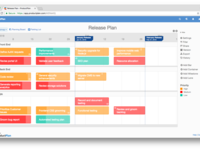 Pros: First of all, the quick start means a lot for any software, and ProductPlan has provided us with the ability to import data from, for instance, VSTS, Jira, or a casual spreadsheet to enable us to build a roadmap like in a brace of shakes. On-the-fly scheme of updating our plans from ProductPlan has impressed us with the ease of drag-and-drop toolbar and such structural elements as lanes and containers. 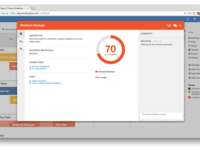 Cons: Besides the fact that ProductPlan is pretty simple in navigation, as well as its customization, we like that we can get the appropriate help from the vendor to make troubleshooting really fast and progressive. Of course, we wouldn't mind if the vendor decided to add some new functionality in the present one, but we are completely satisfied with the current abilities. Super intuitive and easy to use. 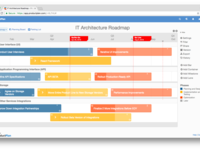 Pros: Our organization was in need of a fast, visual roadmap for all initiatives across the company. I was able to get it up and running from the ground up that evening and present it to the entire organization the next morning. We're now using it for all our roadmaps and planning. Your Customer Success group is second to none and treat all users like VIPs. Cons: There have only been a few things I've noticed that need improvement and your CS and Product groups have been very responsive to our suggestions. One item was actually addressed and fixed for us within a week! Overall: Simple, fast roadmapping visualization for the entire organization. It's my new goto tool for all product planning and communication. I use it for everything! Pros: It has a very intuitive and simple interface yet with all the features needed for proper planning. The integrations are really helpful for tracking progress, specifically JIRA. Cons: It doesn't have a rollback feature in case I make mistakes. Selecting multiple bars and making changes would be helpful, along with hover-over tool-tips showing the beginning and end dates instead of clicking on the bar. Overall: Ability to organize and clearly communicate a visual plan for our team and senior stakeholders. Pros: The visual aspect of this software is what I like most about it. It's easy to see quick glance what projects you should be working on, and what you have coming down the pipe. Cons: Not the easiest product to get started with since it has so many features. Overall: This product keeps me organized and on track. We use this software to score and rank software enhancements. Pros: The ability to keep a main list of projects within the parking lot and score them in our quarterly meetings. Cons: The road mapping portion is a little generic. When flagging milestones the icons are a little hard to recognize what they stand for. 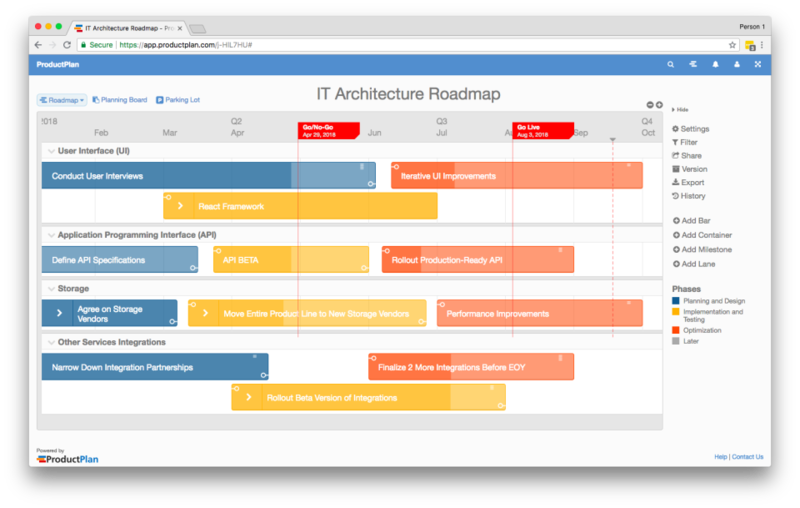 Pros: It accomplishes its core goal of visualizing a product roadmap without a ton of bells and whistles. Cons: It's hard to collaborate with my team. Not everyone has a paid account just so they can occasionally update one bar on the roadmap, so it falls on the 1-2 people that do. Users can't comment and suggest changes. Great onboarding and VERY easy to use! Pros: What I like most is that it's very intuitive and so easy to use. We didn't have to kill ourselves and spend a lot of time just learning how to use the tool. It was great to have our entire cross-functional team on it and using it right away with no issues or major questions. We've abandoned other tools in the past because they were so hard to learn and/or a pain to use...I feel our productivity actually went down with those! The ProductPlan software seems like it will have more staying power for our team. Yay! Cons: I know you can add links, but it would be great if you could also attach documents to tasks/activities. I also would love it if you could link activities on the timeline so if the timing on something (e.g. a gating item like a key deliverable) gets changed, when you move it, it will move all other tasks associated with it too. Right now even though I may have things linked, I have to manually move a whole bunch of stuff one-by-one if there is a component delay or something. Pros: Has a ton of features, is a web app, has a great free trial without limitations, cc details and it's a full month. Workspace design is simple and customizable, Product Plan also has an in-app tutorial which I found useful. Cons: Too many features, I feel like there should be several user levels depending on what kinf of projwct you work on. Too many distracting things that require a lot of time to eithr master ot mark as unncessary. Overall: You can plan and work on any project from building a shed to creating software. Pros: Compared to some of the other tools I reviewed, I was building roadmaps within minutes with Product Plan. It is self explanatory and leads you as a user. Strong usability. Cons: There are still a few more features and integrations required, but they have been communicited as being on the Product Roadmap. Overall: Ease of use and not a development specific tool. Can be used across all segments of the company. Captures of the narrative you are trying to communicate. Solid content to support and educate those who are building for this first time. Pros: Drill down and drill up features when collapsing work packages or expanding them. The features to share, export, integrate, and compare product plans are very helpful. Cons: The integration is not seamless with tools like Rally. They however provide an open API to connect. Overall: It has been great. Working on the product has increased my efficiency as a product manager. Describing the product plan to teams and senior management has been very easy. This tool gives great features to balance communication within the organization very well. Pros: Makes it easy for a product team to share high-level roadmap items within an organization. Cons: Clunky integration into systems like Confluence. Board and Parking Lot are get features to be incorporated into the software. Cons: While pretty simple to get going, there are some tricks and tips that make the software much more useful and I needed to be shown these tips. ProductPlan was very easy to learn. We were able to onboard additional users in a couple hours. Ability to see our company roadmap in an easy to follow format. Roadmaps can be created at different levels of the organization...from Executive overviews to agile teams. Cons: Would love to see an 'UNDO' feature added to the map. Oftentimes, a bar gets moved on the map inadvertently and it would be nice to click an undo button. We use Rally for our agile team tracking software. We'd love to see integration added for Rally. Pros: It was easy to self learn ... discovery didn't take too long and I was able to find most of the features I needed on my own. The visual representation of and UI with drag and drop was great. Cons: a little more clarify on some navigation - clear messaging on date ranges (which may have been entered wrong). When I entered date ranges incorrectly, the plan didnt' show as expected - i had to enlist CS (who were GREAT, btw). Pros: The ability to make planning adjustments without commitment to dependices which loses focus on the planning part. Cons: No offline mode or client software to plan when not online. When the software has a lot going on, depending on the browser or CPU you have, it tends to slow down. Cons: The export functionality is too basic and does not provide a nice clear summary in many instances. Excellent trial, hands on support! Pros: I really like the ability to be able to cobine roadmaps, and the look and feel of the product is great. Cons: I would say it could work better in IE, but that is a small issue. It works better in various browsers. Comments: I evaluated several roadmap products in depth and found ProductPlan the easiest and most versatile to use. It didn't box me in, but instead offered me the flexibility to start where I wanted to in the process. I really like how easy it is to create and share theme based roadmaps with multiple levels of grouping epics together. It also provides great tools for backlog management and prioritization. I want to specially highlight their support. They are very quick to respond and always willing to jump on a phone call and go above and beyond in helping out. 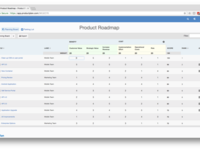 Pros: I have been mainly using ProductPlan to create roadmaps which has been very easy to use and has a lot of great features. I find the drag and drop bars and containers the most helpful as they make roadmaps super easy to create and adjust. Cons: I do not have any major cons right now. I haven't spent much time looking at the planning board or the parking lot. Cons: When adjusting blocks around, it can be tedious to adjust all of them when I want to edit one in the middle.